Italians people love to cook and to eat all togheter with family and friends, specially on sunday.Thanks to the regional cuisines, there are many dishes. In fact, all the nations that have passed from Italy (French, Spanish, Arab,etc.) have left their recipes and their flavours. Today, the Italian cuisine is famous all over the world. Everywhere there are Italian restaurants where you eat the excellent pasta. 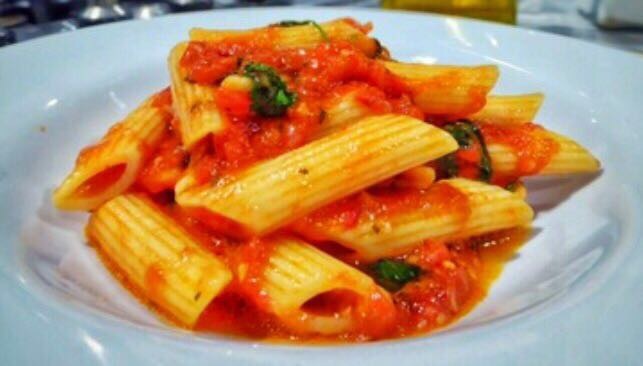 It’s a tradional dish from Lazio, famous dish of “Poor Italian cuisine”, have been immortalised in famous movie like “Roma” of Federico Fellini or “Seven pound in seven days” of Carlo Verdone. The name derives from the fact that, by eating this type of pasta you are likely, because of the chili, to become red, just like when we get angry. The main ingredients are tomatoes, garlic, chili, parsley, salt, extra virgin olive oil. Gently fry the garlic and the chilli into the pan until they are softened, add the tomatoes and salt, gently cook for 30 minutes. Break up the tomatoes using a spoon or fork (if you like you can also blend) and leave on the side. In a salted water cook the pasta al dente, drain, add the sauce and mix very well. Out of the heat add the parsley and mix it again. Try how spicy it is, if is not enough add more chilli, mix again and serve. Please feel free to share your feedback!